WIN this WELLNESS OVERHAUL prize pack valued at OVER $2800!! 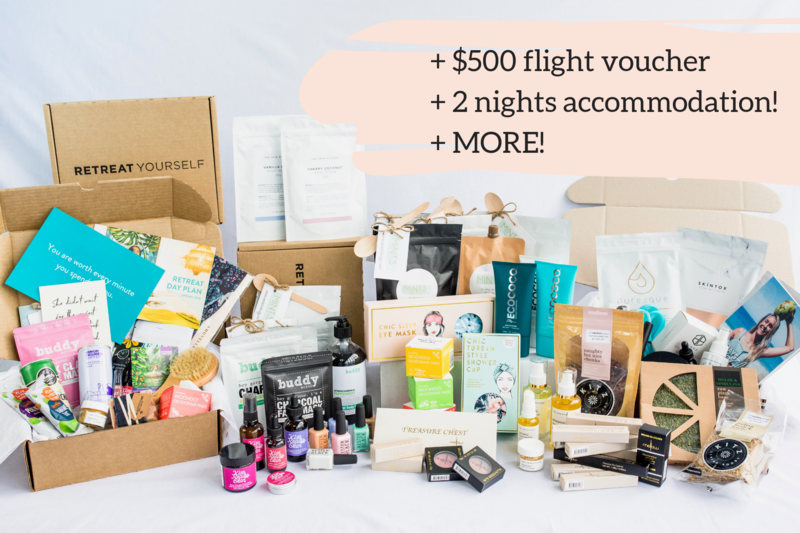 We have teamed up with some AMAZING companies to give this incredible PRIZE PACK including a $500 flight voucher AND 2 x nights’ accommodation at any Choice Hotel Australia or New Zealand! Entry is open to residents of Australia. OVER $2800 WORTH OF PRIZES! Enter our giveaway for a chance to win an AMAZING prize pack to make you look and FEEL incredible! What's included in the prize pack? Competition closes 11.49PM AEST on October 21st 2018. Winner will be announced via email and also on Instagram. Head to Spring Wellness Giveaway Instagram page and follow instructions for an extra entry! 1. This document sets out the terms of participation for the Spring Wellness Giveaway. 2. The promoter of the Competition is RY Entities Pty Ltd (the promoter) (ABN 75625711969), 23 Orungal Court, Torquay VIC 3228. 3. The competition is open to residents of Australia and aged 18 years or over. Employees of the Promoter and their immediate families and any organization or individual associated with the provision of the prize(s) are not eligible to enter. There is no entry fee and no purchase necessary to enter this competition. 4. Each entry must be made in accordance with these Terms and Conditions. By entering the Competition, you agree to be bound by these Terms and Conditions. The Promoter may in its discretion refuse to award any prize to any entrant who fails to comply with these Terms and Conditions. (a) INSTAGRAM ENTRIES; Like the Competition post and follow instructions listed on the www.instagram.com/spring_wellness_giveaway page. (b) LANDING PAGE ENTRIES; Click on the post, advert, link or banner advertising the Competition. This advert will direct you to the landing page. Once you have arrived at the Landing Page, you must provide your full name and email address. 7. Individuals that comply with paragraph 6 are Entrants. 8. Entrants must be (and remain) subscribed to the respective mailing lists or social media pages of the Promoter and will receive regular offers from these entities (via email, Facebook or any other means either deems fit) at the time of the draw. The Promoter will disqualify from the Competition any Entrant who does not meet this requirement. 9. An Entrant may enter this competition once on Instagram and also once on Landing Page (twice in total). 12PM AEST on Monday 22nd October 2018. Only one entry will be drawn, and the winner will be the Entrant whose entry is drawn. 12. The Promoter will deliver each prize of “Spring Wellness Giveaway” to the winner within 28 days of the draw. 13. The Judges’ decision is final and no correspondence will be entered into. 14. Prizes are not transferable or exchangeable and cannot be taken as cash unless otherwise stated. All other prizes will be delivered after winner chosen. Voucher is for accommodation only. Prize is not redeemable for cash or transferable to another person. 1 x Year Subscription involves 4 boxes starting with the Summer 2018 Box. The final box will be the Spring 2019 Box. As per T&C's for the chosen airline. 19. The Promoter does not accept responsibility for late, lost or misdirected entries. Illegible or incomplete entries will be deemed invalid whether they are a result of website users or by any of the equipment or programming associated with or utilized in this competition, or by any technical error that may occur in the course of the administration of this competition. 20. The Promoter assumes no responsibility for any error, omission, interruption, deletion, defect, delay in operation or transmission, communications line failure, theft or destruction or unauthorized access to or alteration of entries, but will use reasonable effort to ensure this does not happen. 21. The Promoter reserves the right, at any time, to verify the validity of registrations and entrants (including an entrant’s identity, age) and to disqualify any entrant who tampers with the entry process or submits an entry that is not in accordance with these Terms and Conditions. Failure by the Promoter to enforce any of its rights at any stage does not constitute a waiver of those rights. 22. The Winners must, as a condition of accepting a prize, at the Promoter’s request, participate in any marketing and promotional activity (such as publicity and photography) in relation to winning any prize, free of charge, and consent to the Promoter using their name and image in any promotional material. 23. All entries received become the property of the Promoter.